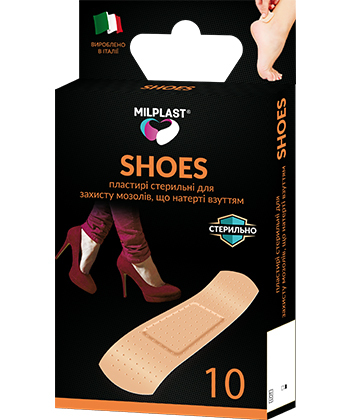 Milplast Shoes callus plasters reliably protect wounds against shoe rubbing. It is especially important for new shoes and during sports. Elasticity and delicacy of plaster materials provides maximum skin contact, preventing uncomfortable shoe contact during walking. Plasters blend maximally into the skin due to their body color. Milplast Shoes can be removed easily and painlessly, without remains on the skin.